World Physical Therapy Day is on 8th September every year. 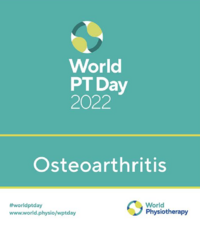 The day is an opportunity for physiotherapists from all over the world to raise awareness about the crucial contribution the profession makes to keeping people well, mobile and independent. In 1996, the World Confederation of Physical Therapy (WCPT) designated 8th September as World Physical Therapy Day. This is the date WCPT was founded in 1951. The day marks the unity and solidarity of the global physiotherapy community. It is an opportunity to recognise the work that physiotherapists do for their patients and community. Using World Physical Therapy Day as a focus, WCPT aims to support member organisations in their efforts to promote the profession and advance their expertise. Reports from around the world indicate that World Physical Therapy Day activities have a positive impact on the profession’s profile and standing with both the public and policy makers. Many WCPT member organisations already have their own national physical therapy days, weeks and months. However, organisations that have no designated day of their own often choose 8th September. It is up to individual physiotherapists and WCPT member organisations to decide what activities and materials they wish to develop. That way, they can reflect key national priorities and messages. But each year WCPT provides ideas, publicity and support materials. If you want to keep healthy, keep moving - all through your life. People who stay active are more likely to keep working, engaging with and enjoying life without having to depend on others. They are fit for life. Inactivity contributes to disability and can directly lead to millions of deaths around the world every year. It can can contribute to morbidities such as heart disease, stroke, diabetes and cancer. You're never too young or too old to stay active and just half an hour of moderate exercise (like walking fast) every day can make a real difference. Physiopedia is starting both a global running club and a cycling club. The clubs are being implemented to better serve Physiopedia's mission of contributing to global health with an aim to promote physical activity for all. What better day to start than on World Physical Therapy Day! This new Physiopedia campaign is an opportunity for physical therapists and physiotherapists around the world to promote the profession and the role it plays in keeping populations active and healthy at every age. By joining either our running club or cycling club (or both like Founding Director Rachael Lowe!) on Strava not only can you stay fit for life yourself but you can also use your membership to promote physical activity to your patients. Strava is social fitness website where people can share, compare and compete with each other's personal fitness data via mobile and online apps. The Physiopedia clubs are open for anyone to join and we're hoping that we can quickly become a super active group of international physiotherapists and physical therapists that are part of the two of the most active clubs on Strava. It's a great way to practice what we preach in promoting physical activity, encourage each other and do it together! To mark the inauguration of the Physiopedia Running and Cycling Clubs we have teamed up with our Gold Sponsor and app developer Clinically Relevant Technologies who has kindly donated some give-aways for our inaugural World Physical Therapy Day Physiopedia Running and Cycling Club challenges. Clinically Relevant Technologies has recently released a new update to their CORE - Clinical ORthopaedic Exam app which "provides accurate descriptions, demonstrative video clips, and statistical references from an exhaustive review of the medical literature for well over 200 musculoskeletal diagnostic tests", and we have 10 of these (iOS, e.g. Phone, iPad, or iPod touch, only) to give away to the leaders in our challenges. There will be three prizes in each category. In addition to this there will be a special prize awarded for the most impressive feat of physical activity. This might not be the longest or highest or fittest, but is for the person who demonstrates the most amazing achievement. Tell us all about your activity in Strava on World Physical Therapy Day. Are you up for the challenge! Set up your profile. It's always nice if we can see a picture of you! Start recording your daily activities of running (or walking) and cycling. You will need a Strava app on your smartphone or a GPS device to do this, the easiest way is to use the free Strava app on your phone. On World Physical Therapy Day (Sept 8th) set about one (or more!) of our challenges. You can be sure that you will not be the only person out and about getting sweaty, know that I will also be out and about recording some kind of physical activity as part of my ACL rehabilitation as well! !